Filler, bottle, Binan Kogyo, last used to fill 2" x 1-1/2" x3-1/2" high 6 fluid ounce plastic bottles. 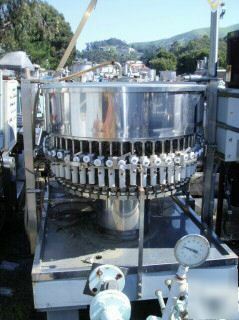 50 valve with feed hopper. Model PH-50AS. All stainless steel product contact surfaces (food grade). Includes infeed and outfeed conveyors, plus gas-fired sealing unit and multi-head trimmer. Also includes circulation pump and control panel.